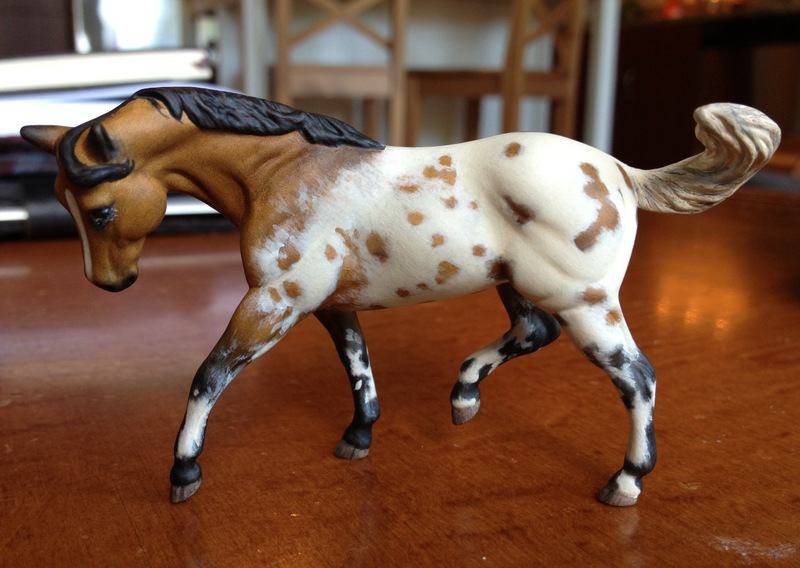 Changing the headset or head position of an OF horse is a great way to make something fun and new. But that means resculpting the neck, which I find very difficult. Inevitably I end up sculpting, destroying, and resculpting a neck at least once before I get something I’m happy with. My latest project was no different. My first attempt at this neck sculpt was marred by several silly failures that I should have avoided from the get-go. I was so excited to have studio time (and inspiration!) that I didn’t take the time I should have to get organized for success. 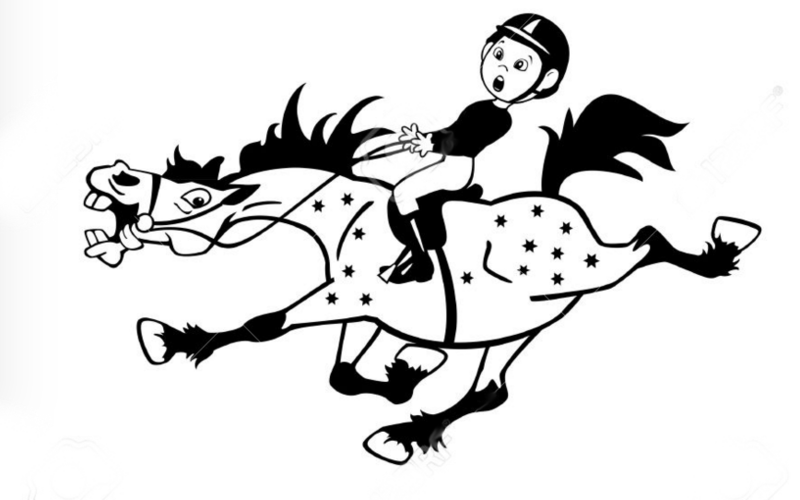 You know how when you are first learning to canter and your school horse won’t canter, you keep kicking and get that crazy super-speed trot and then if you can finally get the canter, it’s bumpy and wacky and barely lasts a quarter of the arena? It’s kind of like that. How many times have I heard my trainer telling the kids at the barn to get an organized trot before asking for the canter? It’s sound advice, and I wish I’d applied it to this project. I don’t have a before picture of the first neck, but I did sort of document my corrections and the renaissance. The first silly mistake was not taking the time to get just the right reference picture. 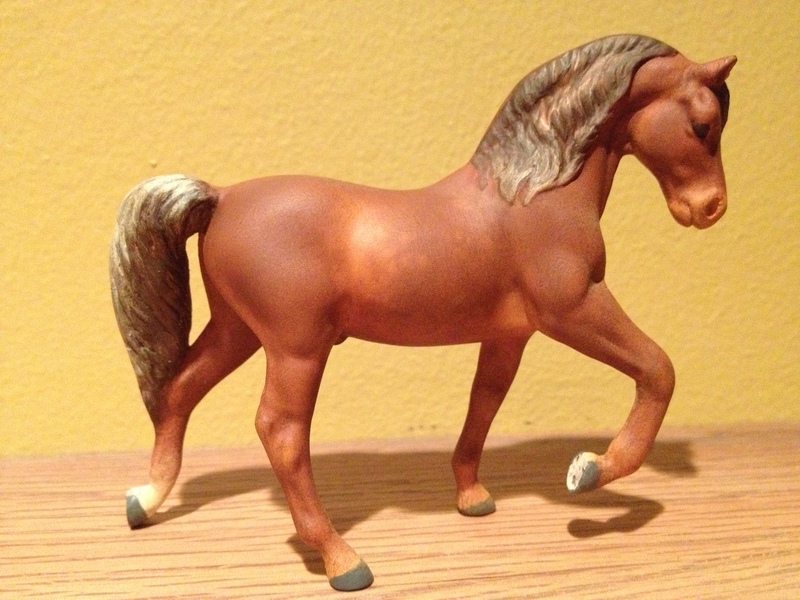 Since my horse is a draft cross, it was important to find a reference horse with similar heavy-ish features. 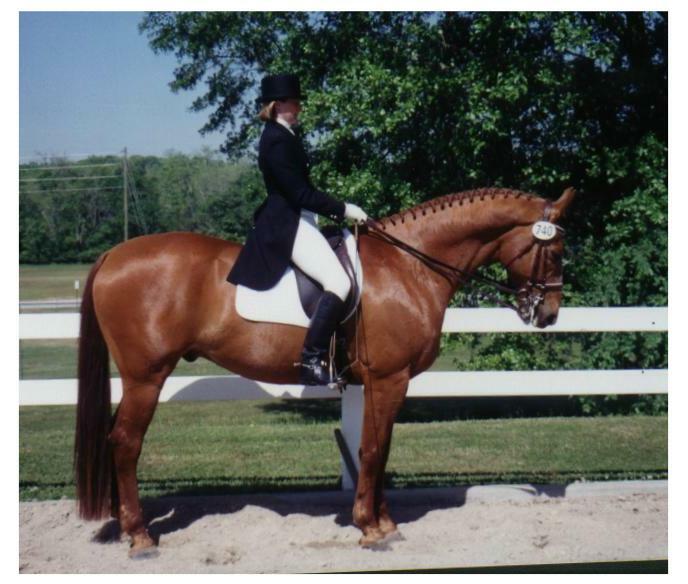 This mare is my next performance horse, so I wanted her to be on the bit, but not with the vertical profile you see in some dressage horses. 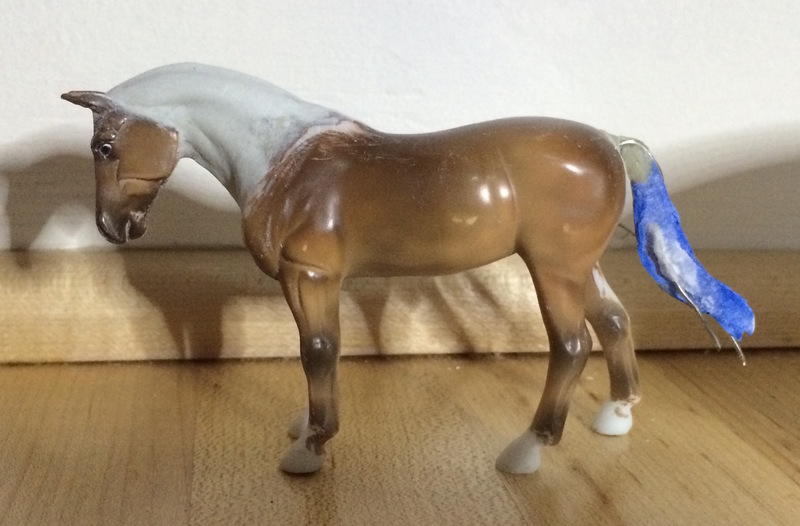 Finally, my model is standing, so I should have a reference with a standing horse. Much better! This is a much better picture to work from for my project. The second problem with my first try is that I had been lazy with my initial dremeling. 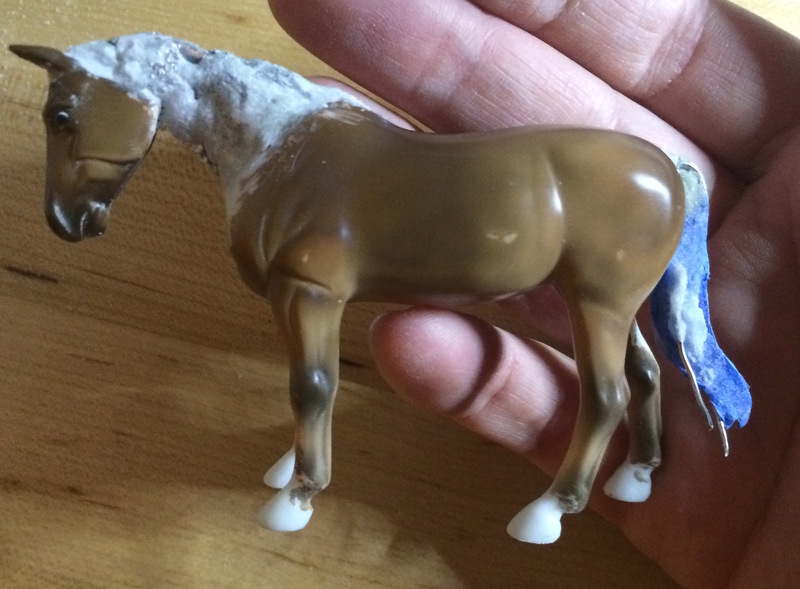 Sure, I’d removed the head from the neck and the neck from the body, but I’d left residual plastic on both pieces that didn’t jive with my vision. Bits of the jaw, forelock, and chest remained which were both distracting and difficult to work around. With something as finicky as a neck, you want things as neat as possible so you can better judge the shapes. As a note, I do like to leave the ears on an OF when I’m resculpting the neck, even if I plan to replace the ears (as I do here). They provide a good visual reference while you get the head where you want it. You can always hack the ears off later. After finding my better reference photo, removing the extra plastic, and re-psyching myself up for the neck, I set about building the basic shape using wire and foil, secured with super glue and baking soda. As I worked, I continually compared my model to the reference picture. You can see above how much easier the neck shape is to visualize now that the excess plastic on the throatlatch, chest, etc. has been removed. 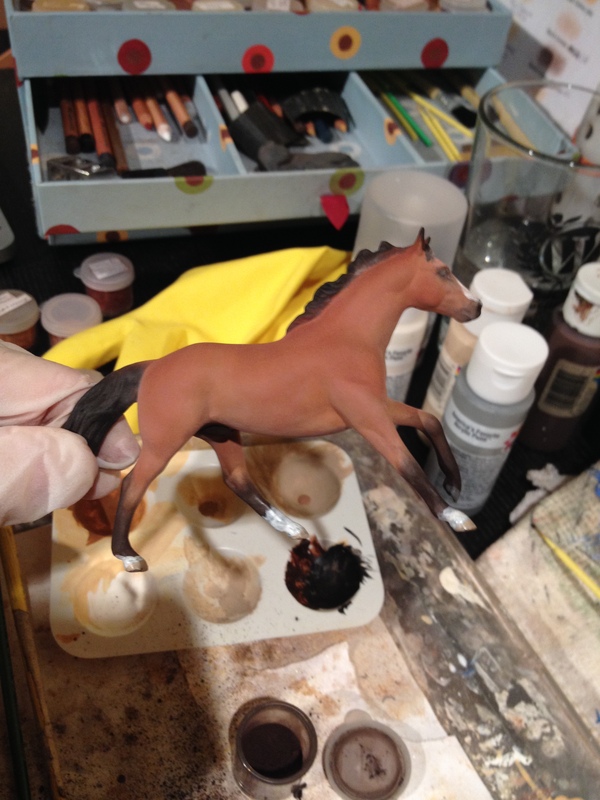 I also made sure that the armature is only that, an armature- I want to leave plenty of space in which to add epoxy- I don’t want to be sculpting away and suddenly hit my solid armature. 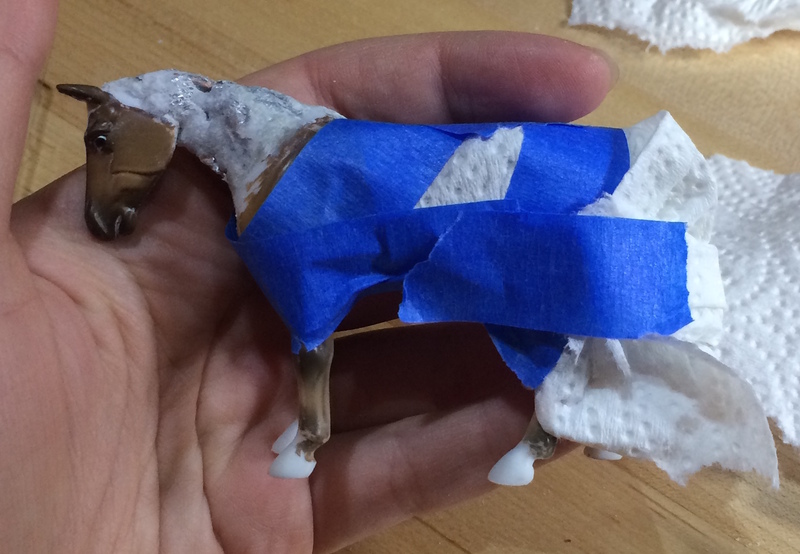 When I was finally happy with the armature shape, I wrapped the horse in paper towel and blue tape (sometimes I use foil and blue tape, it just depends on what I have close at hand). 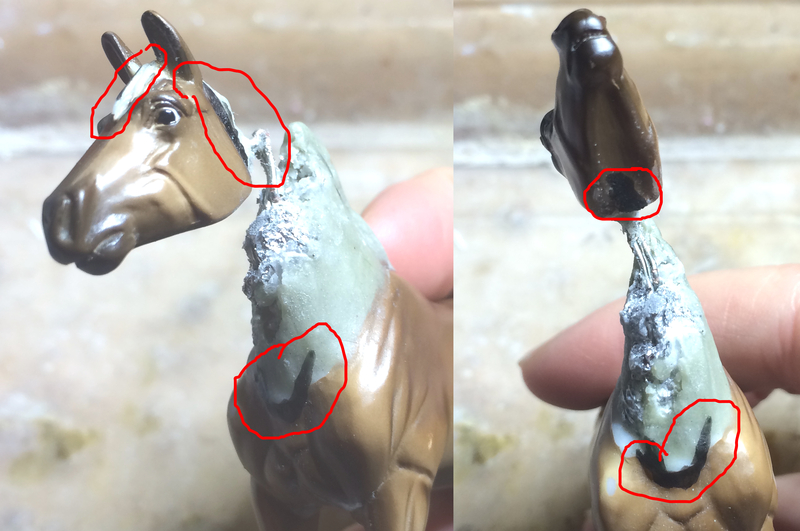 I tend to get epoxy goo everywhere when I sculpt something, so I cover up the smooth bits of the horse to prevent a bunch of extra sanding and prepwork later. 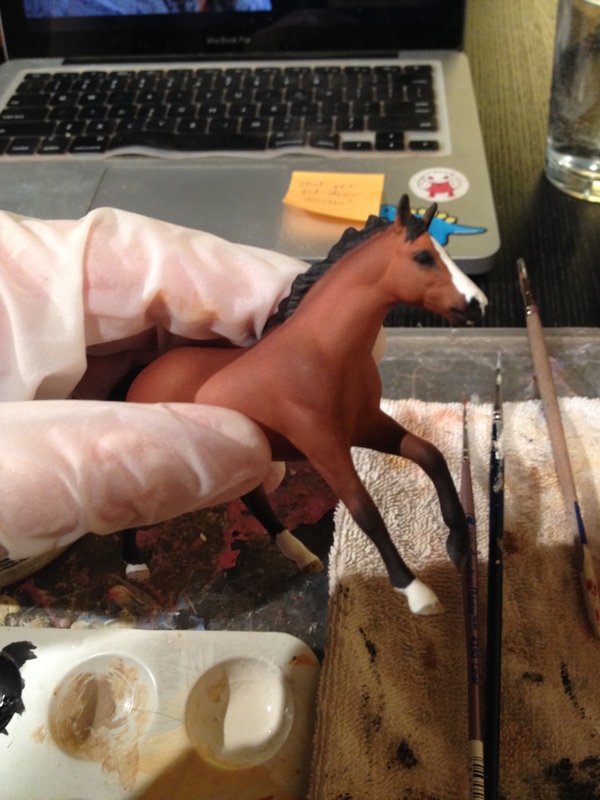 And finally, with the proper groundwork laid down, it was time to sculpt. I follow Laura Skillern’s recommend method of laying down blobs for each major muscle, and then blending. It’s a handy way to get a headstart on the shapes you want. From there it’s all blending and smooshing and blending and smoothing. I looooove my clay shapers for this step. Happily, my preparation paid off. 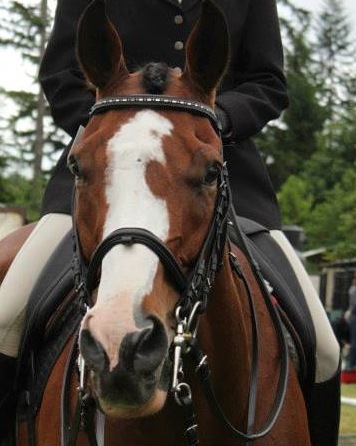 My horse has a neck, and she gets to keep it this time. I’m not really one for New Years resolutions, but I really would like to be blogging more. I’d love to get to a point where I’m posting a few times a month, instead of the current sorry state of a few times a year. It’s not that I haven’t been active in the hobby- I’ve been showing, customizing, and following my favorite hobby blogs. I have things to share… I just need to share them. Last night I snuck in a bit of customizing amidst the holiday busyness. 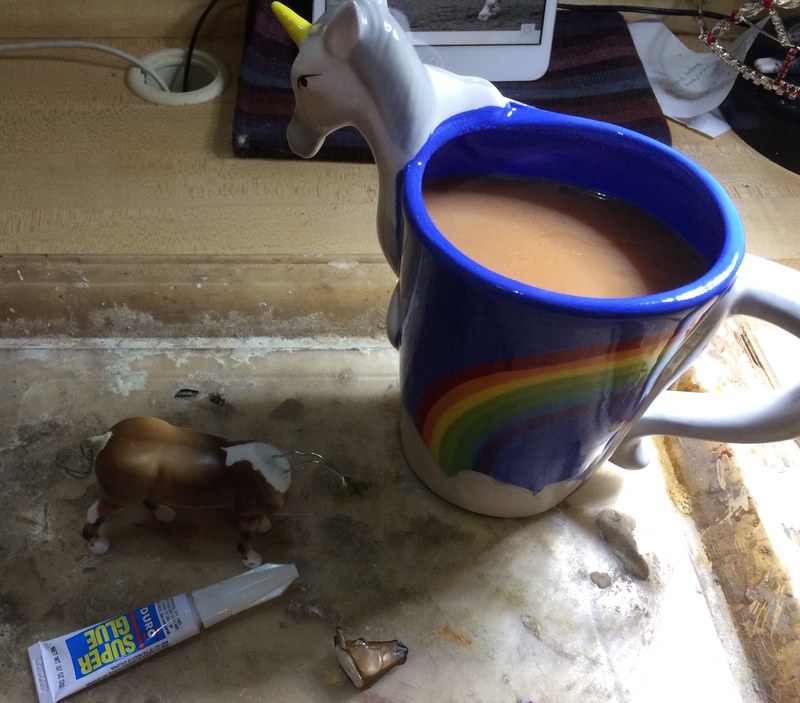 Erin had just given me a stupendous unicorn mug and I was very pleased to be drinking my evening tea out of it while building a neck for my next performance horse. Isn’t the mug delightful? 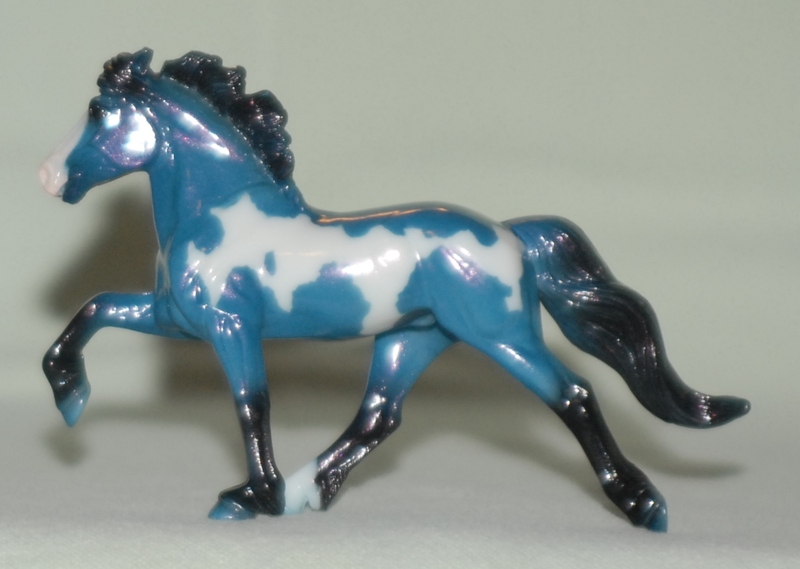 It’s a stunning example of equine anatomy. Necks are always a pain to get right, and I was holding up my horse pieces and squinting at my reference… and the inevitable happened. I was so stunned that for a few moments I just sort of stared at my tea. I briefly considered fishing the head out with a sculpting tool (they were near at hand) but I figured that a spoon would be cleaner and easier. The head was rescued and is now securely attached. 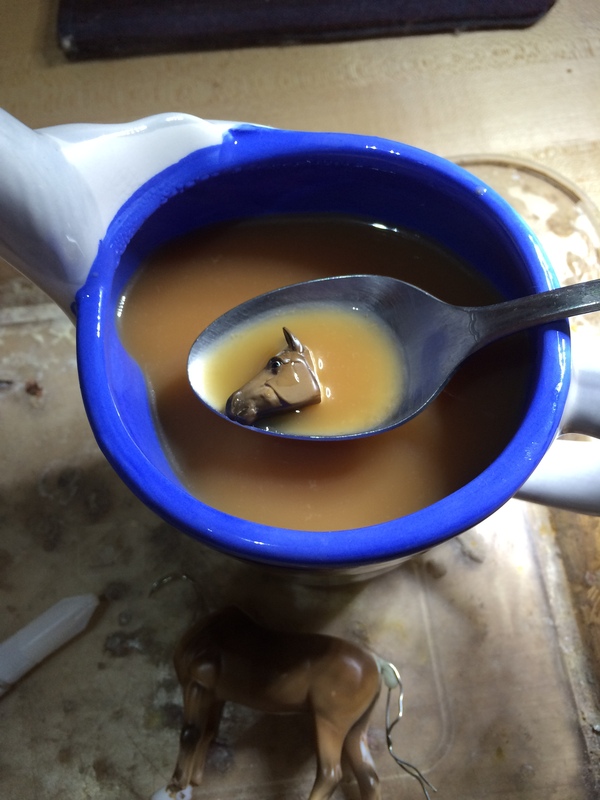 And I learned an important lesson about holding small plastic bits over vats of heated liquid. I was really looking forward to getting home and enjoying some hobby time, but weather and life had other plans. We came home to a freakish cold spell- the coldest it’s been in Oregon in my lifetime. Since cold can wreak havoc on primer and fixative, I’m limited in what I can work on. To add to that, I can home from California with a bad case of poison oak- so bad that my whole face swelled up and one eye was swollen shut! So my downtime pretty much involved lying on the couch icing my face. Luckily, I also got some steroids to take so I was feeling (and looking) better pretty quick. 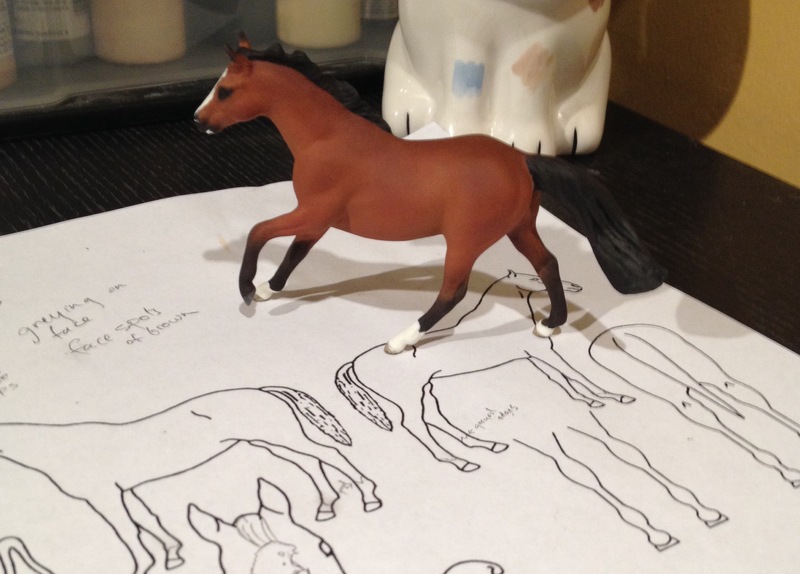 I was jonesing for some hobby time in general, but I also wanted to get back to work on the portrait horse I’m making for my trainer. I base-coated him in acrylic and I decided to try doing a bit of pastel on him and see how the fixative behaved in our freezing temperatures. I figured that if the fixative did go wonky, I would only need some sanding and another coat of acrylic to get him back. Luckily, the fixative worked pretty well, so I was able to make a lot of progress on this guy. At first I made him a little too red, but I was able to back it out a little and I think I got the nice red bay I was going for. I did several layers of pastel over a weekend to get his body color where I wanted it, and I’ve been using my free time on weeknights to work on his acrylic details. Ducky is a somewhat challenging horse to do a portrait of because he has a very intricate blaze, and even his leg markings have pretty unique edges. I’ve been doing a lot of layers followed by buffing. The temperatures are still mostly below freezing, but they’re supposed to come back to the usual 40’s later this week. 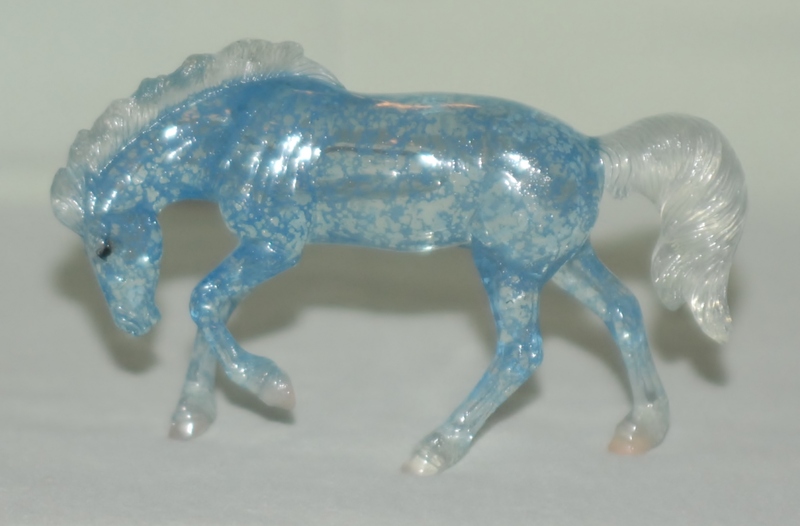 Even with my success (and/or luck) with fixative on Ducky, I don’t want to try doing primer, or spraying fixative on a grain-prone color like palomino. So those projects will have to wait. But I’m sure glad I was able to make progress here! Hopefully I’ll be gifting this little Ducky next week. 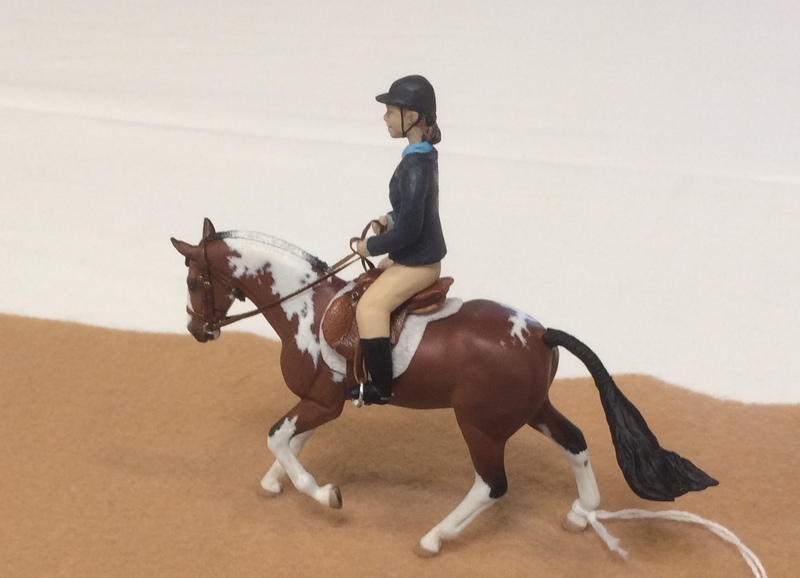 As you probably already know, last weekend was Breyerfest. 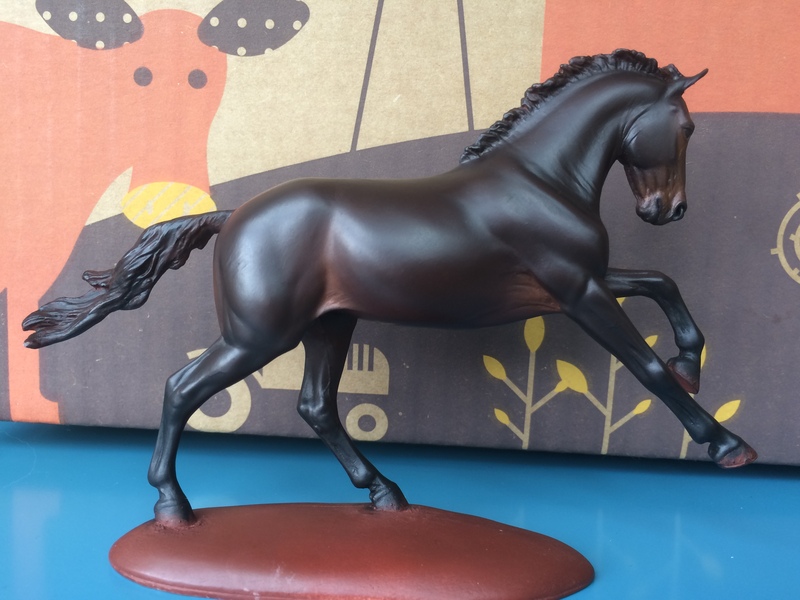 The lucky attendees got the chance to own the newest molds in Breyer’s stablemate line. So far these guys have only been released in this one special run and are commanding hefty prices online, but I’m sure hoping they’ll be out as regular runs soon. and my personal favorite, Rivet. I’m happy to report that I’ve got one of my MEPSA donations done and the other one is in the home stretch. Just in time too- the Year-end Champ Show is just around the corner. I sent in my qualifiers last week. Next year I’m hoping to seriously improve my photos and get serious with the monthly shows. 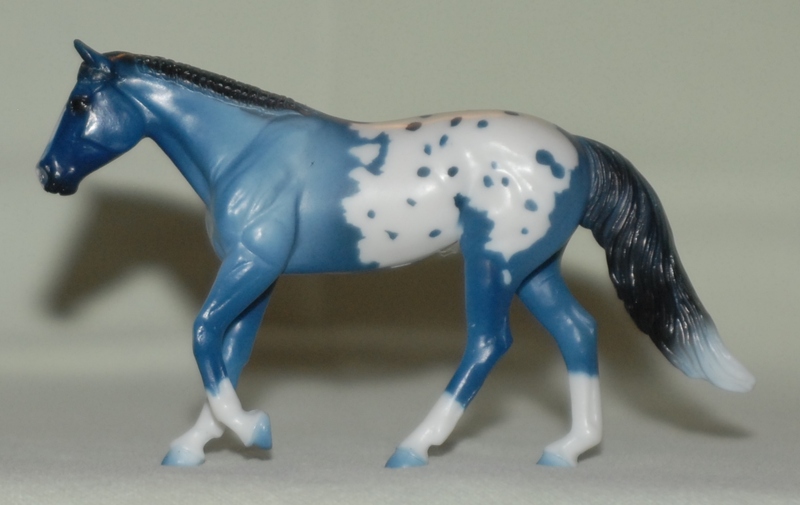 I like how his appy markings turned out. I did them in a combination of acrylic, pastel, and pencil. Not too long ago I was thinking I’d need to re-start the Morgan. He was looking really orange and not behaving. But I’m really glad I stuck it out, because this is what he looks like now! Big thanks again to everyone who voted for their colors! 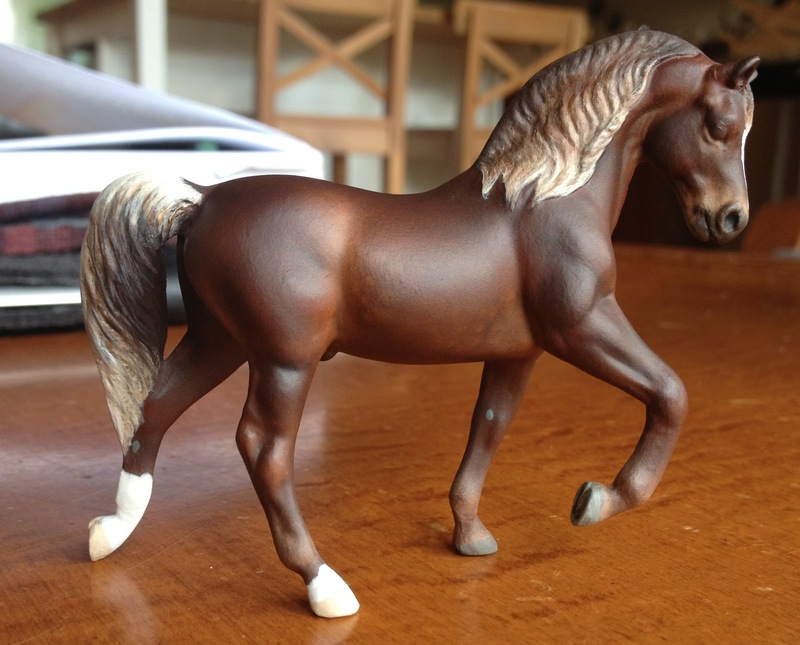 While I was lounging poolside in Cabo, my friend Caryn was showing her minis at Erin Corbett’s Tiny Hoofbeats Live. I had limited wi-fi in Mexico, but I did manage to receive a very exciting email from Caryn that afternoon. 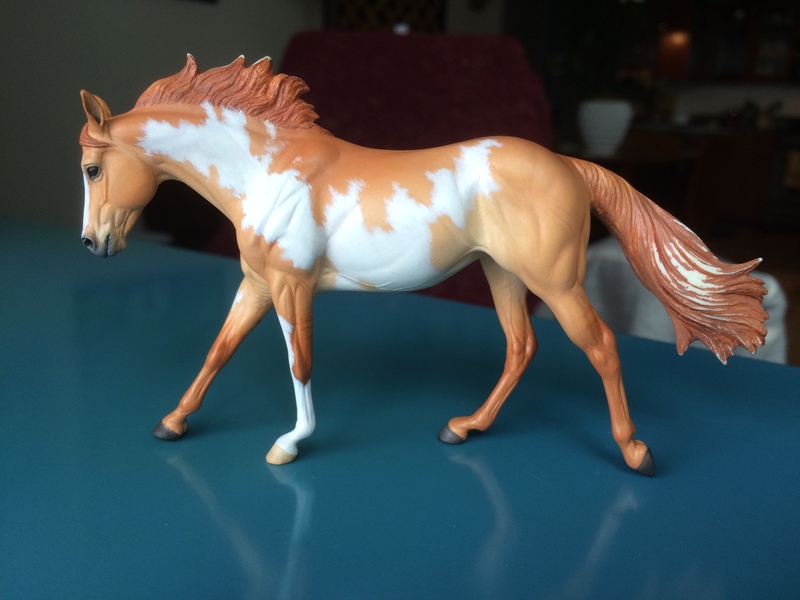 Two horses that I painted double NAN qualified in both breed and workmanship. 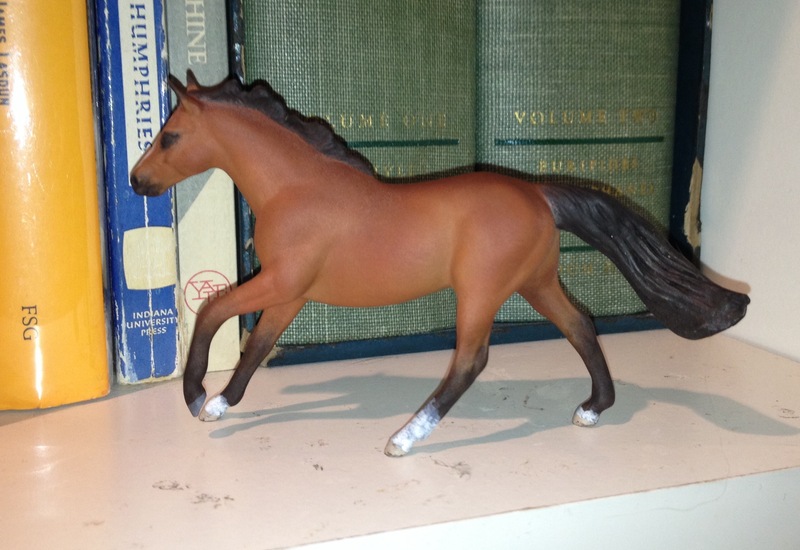 Aylwen is a G3 Highland Pony that I painted into an olive dun for Caryn. I finished her up last fall as part of a trade. 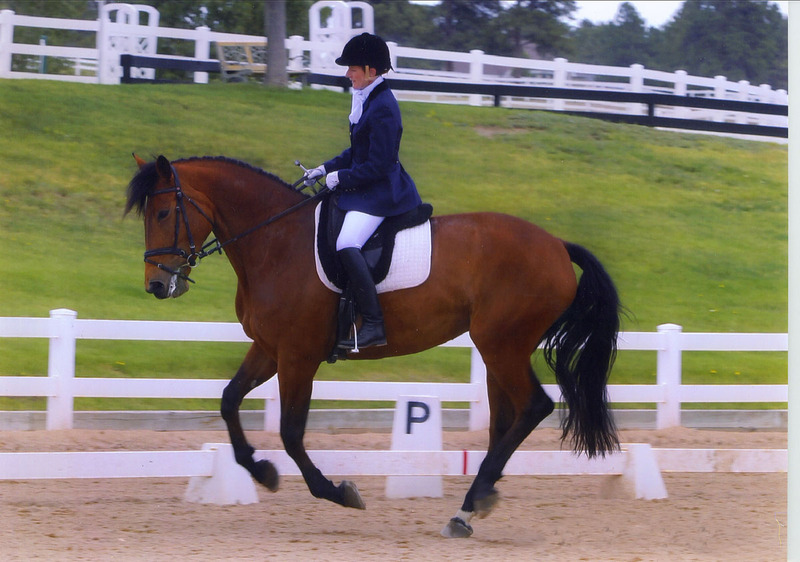 She shows as a Highland Pony, and in addition to her Workmanship win above she also took 2nd in her breed class! 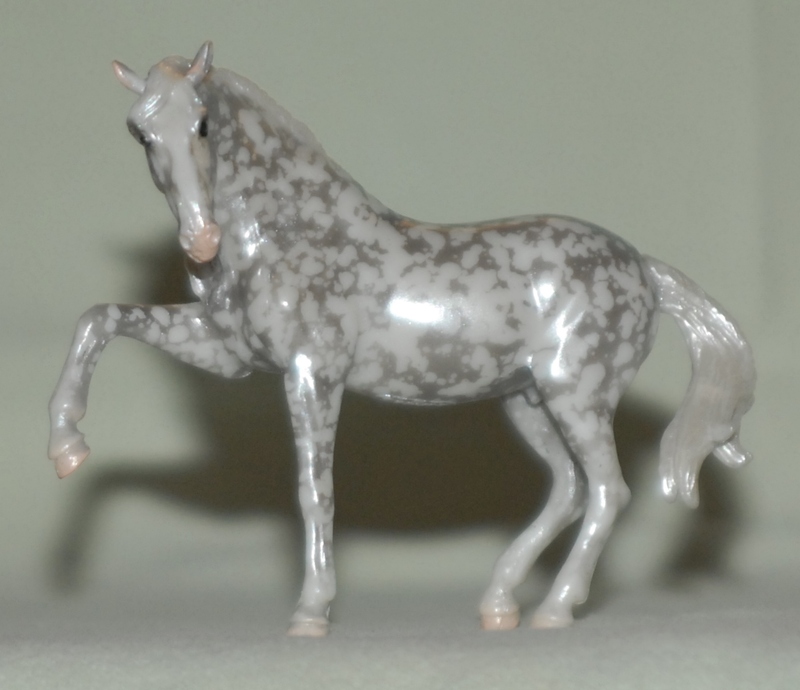 Vortex is a wild leopard appaloosa that I painted for Caryn’s husband, Martin. 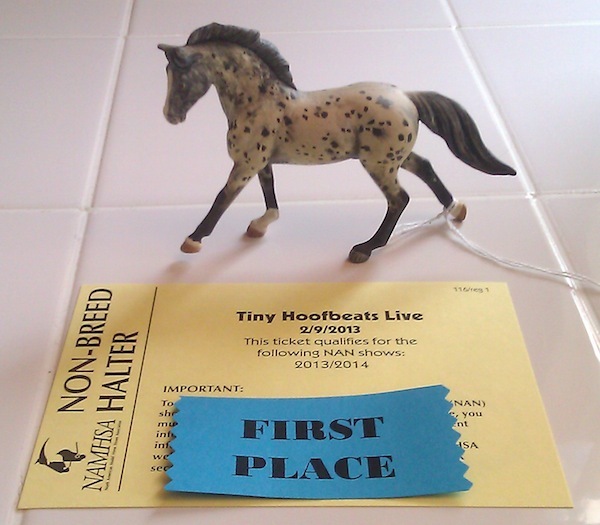 He won ribbons (and a NAN card) at NW Congress and Rose City Live last year, but this is his first blue. And like Alywen, he also took 2nd in breed! And Caryn said people were asking who painted him, which is a huge compliment and made me feel very warm and fuzzy inside. I also sort of had a hand in Caryn’s two biggest wins of the day, a Workmanship Championship and a Breed division Reserve Champ. 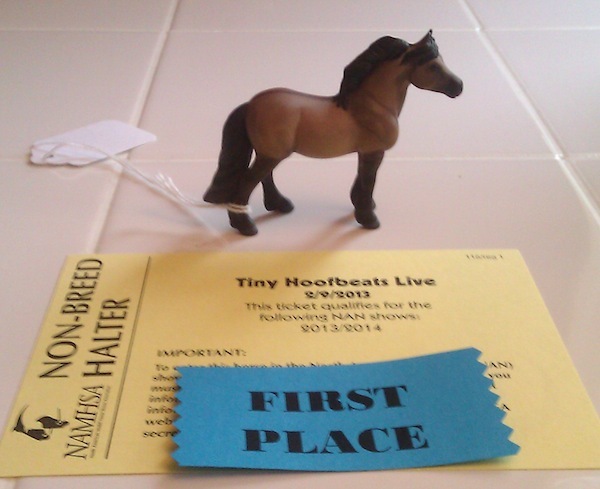 Those were both won by her little Morab mare, who I won in the MEPSA Championship show last summer. 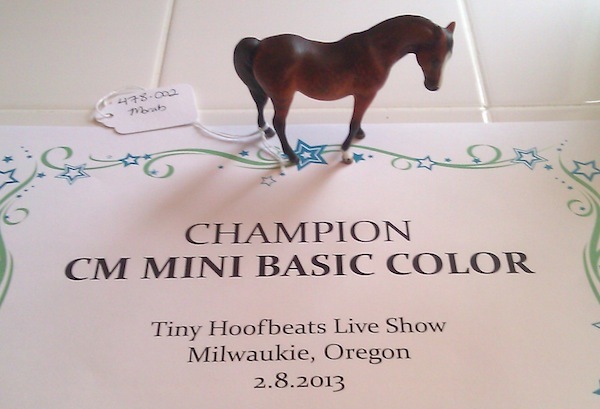 She was the prize for Novice Halter Grand Champion, won by Kettil Blacksmith. Since I only keep my own work (and Caryn loves Arabs) I gave the model to her. Congratulations Caryn! I wish I could have been there. Next year!